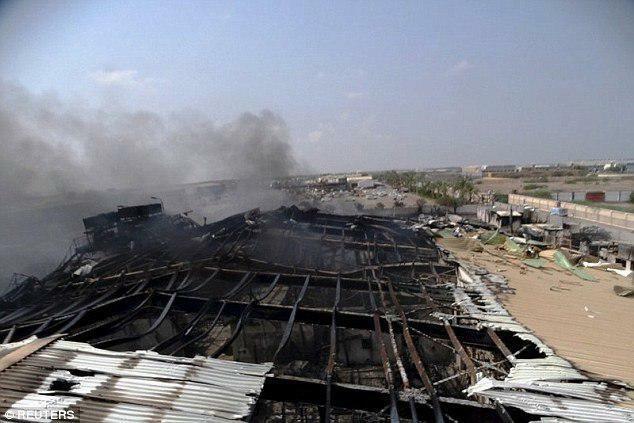 SANAA, Sept. 12 (Xinhua) -- At least 15 people were killed on Wednesday in airstrikes by Saudi-led coalition warplanes fighting Houthi rebels in Yemen's Red Sea port city of Hodeidah, a hospital source said. "Fifteen people, including five civilians and 10 rebel fighters were killed in the airstrikes that targeted several rebel sites and rebel-controlled checkpoints near and around Kilo 16 road linking the capital Sanaa," the source said on condition of anonymity. "The civil victims were members of internally displaced families traveling on the road to flee the escalating clashes and airstrikes," said the source, adding that dozens of others were wounded in the attacks. The government troops backed by coalition warplanes and Apache helicopters have been pushing deep around the rebel-held port city and have already advanced into near the Kilo 16 road to the east of Hodeidah airport. The push came after UN-hosted Geneva peace talks earlier this week failed after the Houthi delegation refused to leave Sanaa, citing their immediate demands were not met. The clashes and airstrikes on Sunday and Monday have killed at least 15 soldiers and 47 rebel fighters, according to sources from both rival warring forces. Hodeidah port is the entry point of about 70 percent of the country's food, medicines and aid. Yemen has been locked into a civil war since the Houthi rebels overran much of the country militarily and seized all northern provinces, including capital Sanaa, in 2014. Saudi Arabia is leading an Arab military coalition that has intervened in the Yemeni war since 2015 to support the Yemeni elected government of exiled President Abd-Rabbu Mansour Hadi. The war has since killed more than 10,000 people, mostly civilians, and displaced around three million, triggering the world's most humanitarian crisis in the poor Arab country.